Less than 48 hours away to my 8th States and 15th marathon; as now, weather.com forecast 60% to rain on Friday and 50% on Saturday. This is no good! BUT it’s possible to change… Last year, weather also forecasted to rain on race day in Corning NY; but it didn’t drop any during the race and turned sunny afterward … I am knocking on wood that weather gets better on Saturday. At last, based on NY Times article, I should be able to run faster in races than in training; that makes sense!!! Right? You want some anger? Well, YUKON JACK, YOU HAVE A FUNNY NAME!!!!! 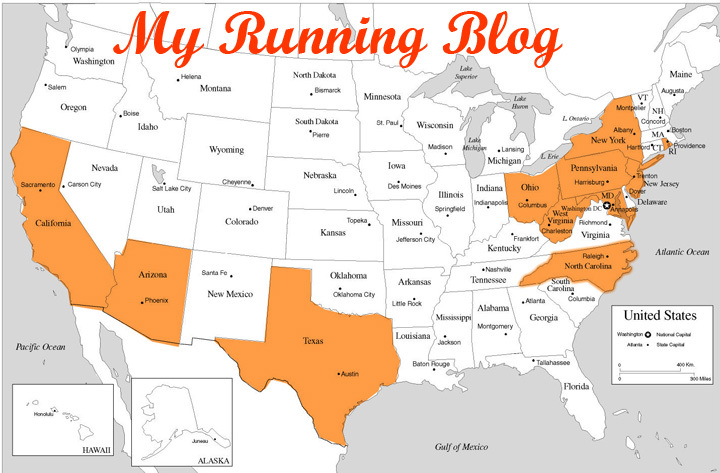 Why are you on your 15th marathon but only your eighth state? You'd better skedaddle if you want to cover all 50. Why are you running awful Akron anyway, do you want to be mugged? why not http://www.towpathmarathon.net/? WTYF? Get fired up!!! !